SAN SEBASTIÁN, Spain, Sep 22 2010 (IPS) - One of the causes of Spain’s deep economic crisis is the country’s limited ability to export goods with high added value. But the pioneering renewable energy sector has the potential to fill that gap. Unisolar already exports to Chile, and is beginning trade negotiations with Colombia and Guatemala. It sells manufacturing technology and the associated specialised equipment, components and systems. Another Spanish company, with a presence in Chile since 1987, is Abengoa, with its solar and wind energy projects. The firm made front-page news when U.S. President Barack Obama approved a federal loan guarantee of 1.45 billion dollars to build a thermosolar energy plant in the southwestern state of Arizona — a project entrusted to the Spanish company. 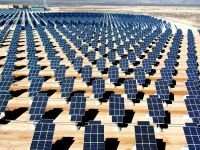 “Last year, Spain’s photovoltaic industry exported 75 percent of its production, mostly to Germany. Latin America continues to have marginal weight due to the lack of incentive policies for the systems connected to the network,” said Tomás Díaz, public relations director of the Association of the Photovoltaic Industry, a group of 474 companies. “Some countries, like Peru, or those lagging further behind, like Mexico, are beginning to implement such policies, but they are still not enough to create a photovoltaic market,” Díaz explained to Tierramérica. Renewable energy sources represented 62 percent of new electrical generation capacity in the European Union in 2009, an improvement on the 57 percent reached the year before, according to a Jul. 5 report from the European Commission, the EU’s executive body. The solar sector is on the rise. According to the Association of the European Photovoltaic Industry Association, dedicated to direct conversion of light energy into electricity, this sector aims to supply 12 percent of Europe’s electricity by 2020. And Spain is one of the world leaders in photovoltaic energy, with installed capacity estimated at 3,200 megawatts, coming in second to Germany’s 3,850 megawatts. The Abu Dhabi-based consortium Masdar chose Abengoa Solar, along with France’s Total, to build and operate the Middle East’s largest solar energy plant. Meanwhile, Masdar and the company SENER set up a joint enterprise, Terresol Energy, to build and operate concentrated solar energy plants around the world, a technology that uses lenses or mirrors to focus light onto a small photovoltaic surface. A study presented Dec. 1, 2009, by the consulting firm Deloitte states that the economic impact of the renewable energy sector on Spain’s gross domestic product reached nearly 12 billion dollars in 2008, or about 0.67 percent of GDP. However, the report continues, “the situation is not as good as it seems.” Based on data from the International Energy Agency, Latin America’s renewable energy sector is almost completely dominated by hydroelectric and biofuel sources. “Included in those numbers are big hydroelectric dams, traditional uses of biomass (such as burning firewood), which truly reflect the region’s poverty and not positive data on sustainable energy,” said Díaz. What do the Spanish companies have to offer? “Spain has had extraordinary development (in renewable energy sources), which has placed it among the world’s leaders. All of the knowledge and resources, if not utilised in the domestic market due to regulatory problems or restrictions, the stronger companies are going to implement abroad,” an energy analyst told Tierramérica.